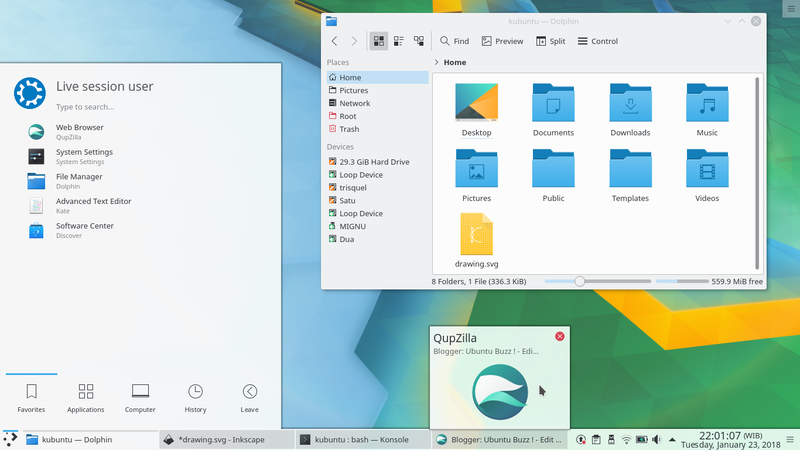 Familiarize yourself with Kubuntu appearance. You can start from placing icons at desktop area, like you often did with MS Windows. 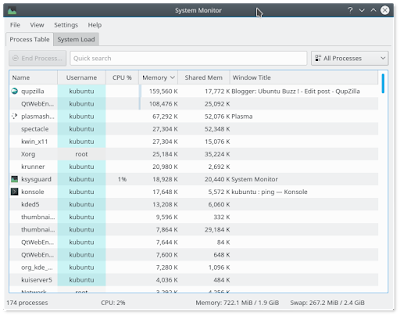 Then, to make everything easier, have fun with the menu, taskbar panel, and knowing where to access most important things (such as file manager) on Kubuntu. Enjoy! 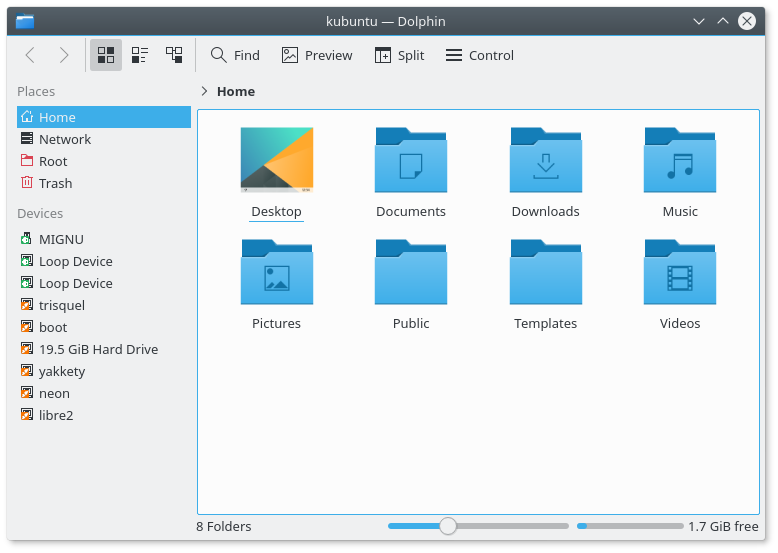 This is a continuation of Kubuntu Artful Guide Part 1. This picture depicts how Kubuntu looks like. If you are familiar with MS Windows, you need no introduction. Consistently, since its first appearance in 2005, Kubuntu bears Windows-like interface with bottom taskbar, bottom-left menu, and bottom-right tray. 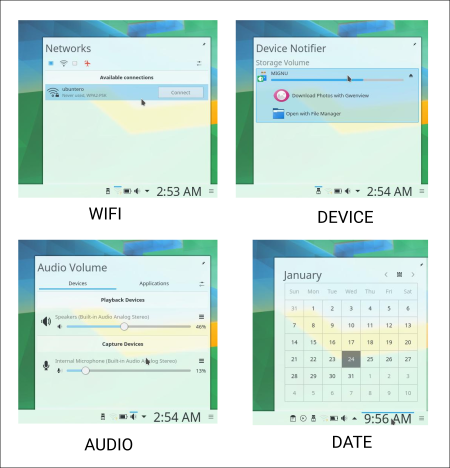 Notice also each window is very familiar with control buttons at top-right. 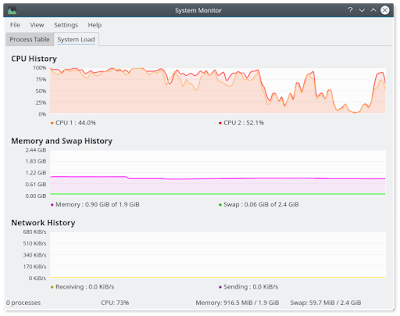 In 2017, with Kubuntu version 17.10 "Artful Aardvark", it improves with more beautiful interface. You feel the interface similar to the legendary Windows Vista (for the overall Aero-like effect) and Windows 8 (for the flat color). 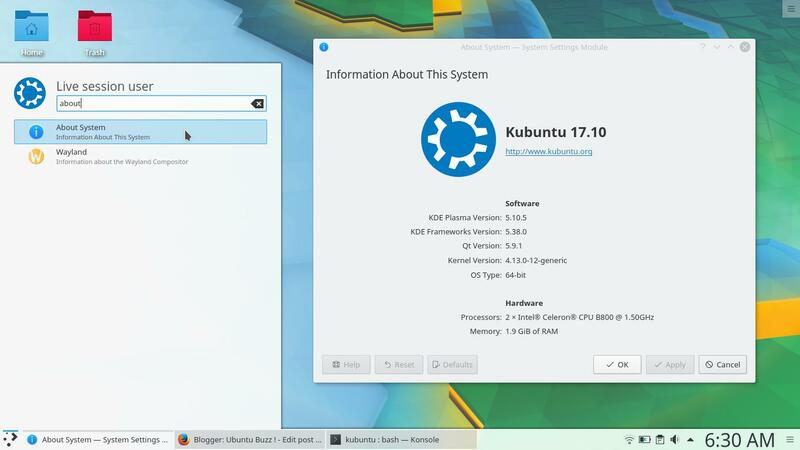 What you see on the screen while operating Kubuntu is the user interface called KDE Plasma Desktop. 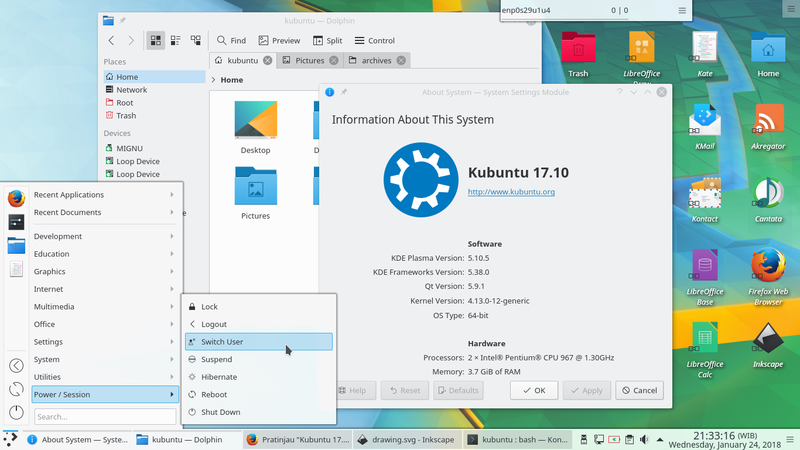 It's Plasma version 5.10 at Kubuntu 17.10. The control buttons on each window are in the same position and order like on MS Windows. From right to left: close, maximize, minimize. See picture below. If you see a "?" 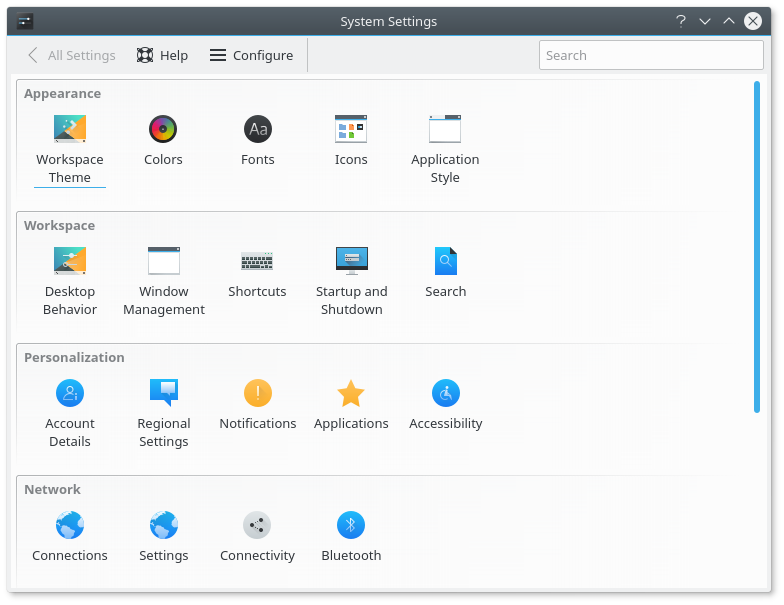 (question mark) button, that is a special button of KDE Applications, meaning "What's This". By clicking "?" your cursor will be followed by a blue circle with "?" mark, and can click any button on window you don't know to reveal for-what-purpose that is. 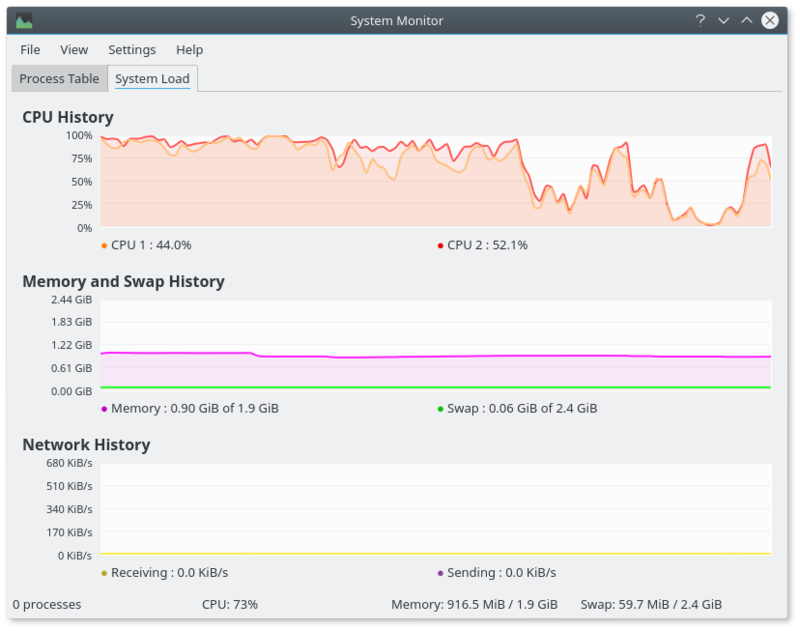 See for example the What's This clicked on System Monitor. Do you want to know version of your OS, your computer processor and memory capacity? 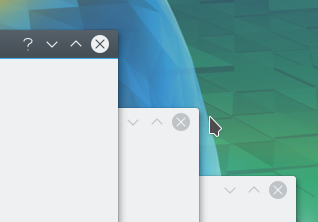 On Kubuntu, click bottom-left menu button > menu appears > type "about" without quotes > About System entry appears > click it > your system info showing. 3. Put your favorite icons! 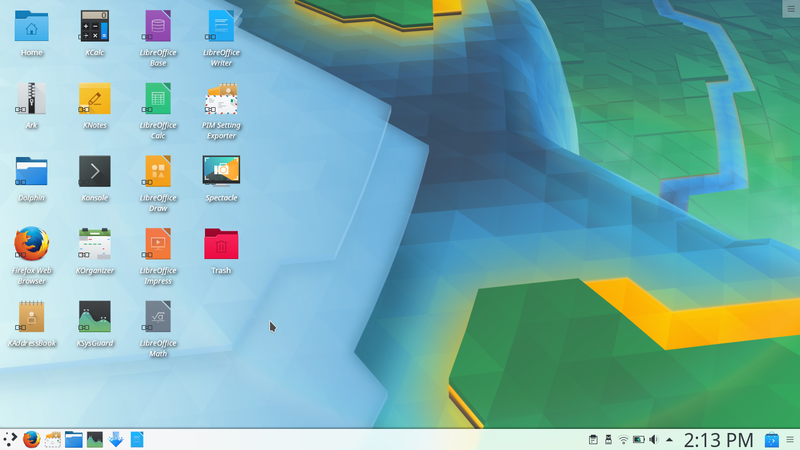 You can put icons on desktop area and also on panel. To have it on desktop: click the menu button > menu appears > right-click an icon > Add to Desktop. To have it on panel: click the menu button > menu appeas > right-click an icon > Add to Panel. 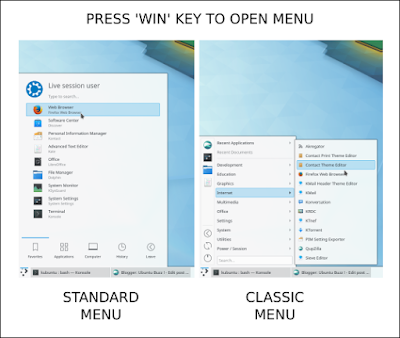 There are 2 ways to open the menu: press Win key or just click the menu icon. There are 2 forms of the menu: standard and classic. The standard is the large, stylish and modern one, while the classic is the small, cascading one. Both forms feature search bar so you don't need to worry. To change between standard and classic, just right-click menu icon > select Alternatives > select Launcher for standard > or, select Menu for classic > click Switch > menu changed. 5. Where's the windows explorer? Open the menu > find Dolphin > click it. The "Explorer" on MS Windows is equal to "Dolphin" on Kubuntu, as they are both file manager programs. 6. Where's the control panel? Open the menu > type "system settings" without quotes > System Settings icon appears > click it > control panel showing. 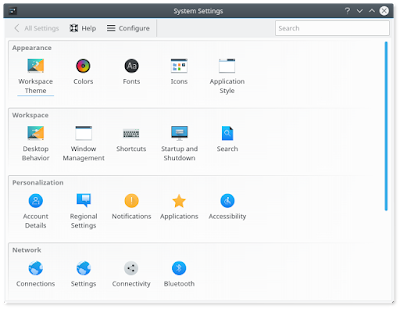 The control panel at Kubuntu is called System Settings. 7. Where's the task manager? 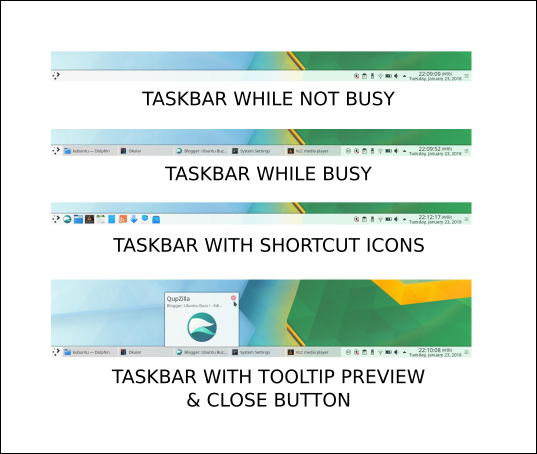 Open the menu > type "system monitor" without quotes > System Monitor icon appears > click it > task manager showing. 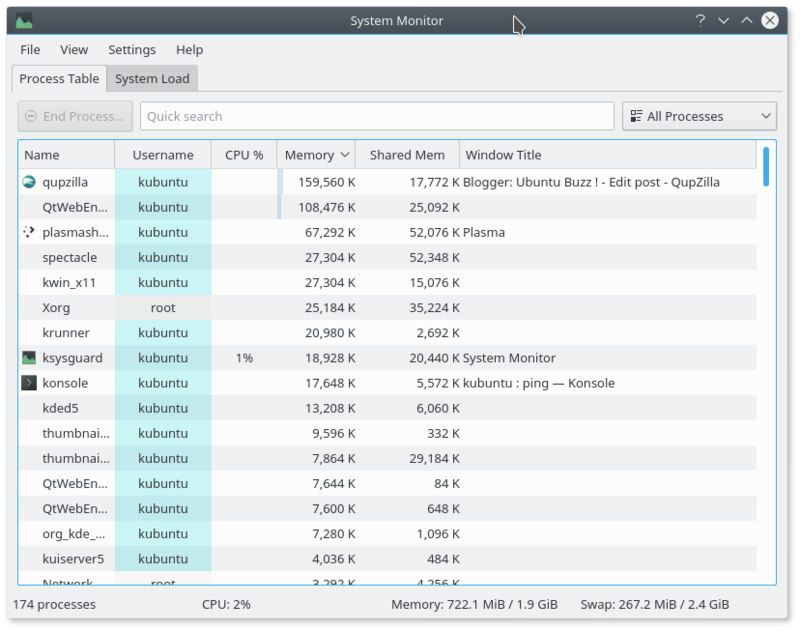 The task manager at Kubuntu is called System Monitor. The bottom panel (a.k.a. taskbar) works the same as your experience from MS Windows. All running programs appears there, menu is placed there, system tray is also there. The system tray works fine with your experience, too. You control your wifi connections (or another networks) from it. You are notified where any USB drive plugged in, increase or decrease audio volume, or simply seeing time & calendar from it. As your experience suggests, yes, you can do "Safely Remove Drive" there by clicking on the black button. The clock is there, at the tray. By default, it shows only current time in AM/PM format. 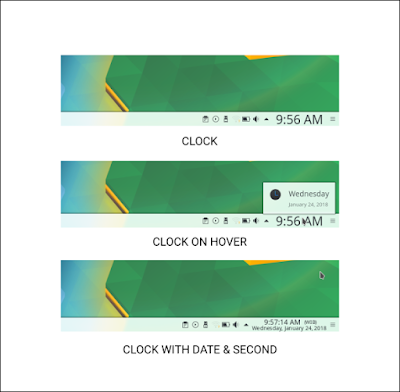 If you like, you can make the clock to show complete time --including year and second-- by right-click > Digital Clock Settings > give check 'Show Date' and 'Show seconds' and 'Use 24-Hour clock' > select Date Format: 'Long Date' > OK.